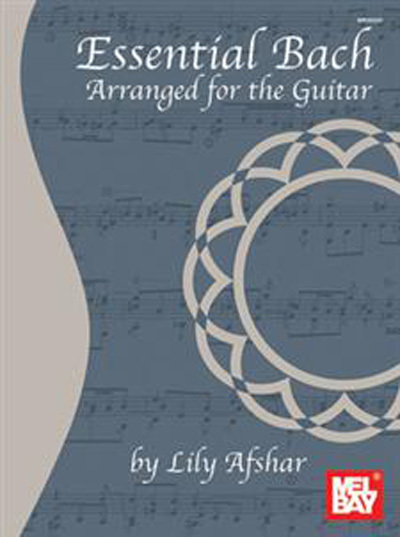 Essential Bach Arranged for Guitar provides guitarists with a new approach to many of Bach's masterpieces. The fingerings in the arrangements make the guitar sound rich and full, as if the pieces were written for the instrument. Attention is given to the musical line by using cross-string fingerings in a consistent manner. This approach allows the harmonies to become more evident as well. By using a more musical approach for the fingerings, playing Bach on the guitar no longer feels cumbersome. Suggested dynamics and articulations are also included. Fingerings and slurs are notated close to the notes for easy reading. Standard Notation. Although I have been told it takes a month before a new set of guitar strings can truly be appreciated, my friend was delighted to receive the gold wound set of strings and the book of Bach tablature for Guitar. I received both items promptly. Shipping was fast, the book arrived in perfect conditions. The music is very well written and the service provided by Strings by Mail was awesome. Q: does this contain J S Bach Preludio and Fuga from Suite in A minor, BWV 997 for the guitar ? I'm specifically looking for the guitar transcription in A minor ( originally in C minor for Lute ) ? Yes, those two pieces are included and are adapted to the key of A minor. Music only, with no tabs. Hope this helps.